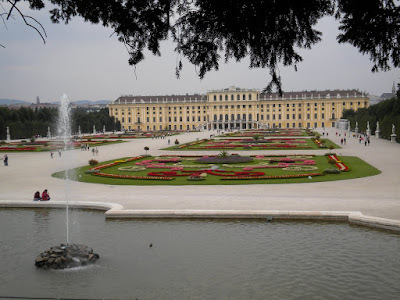 The last stop on our Europe tour was Vienna. 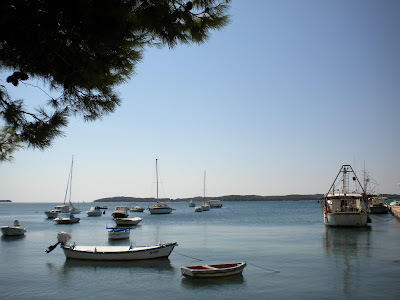 Honestly, it was our least favorite but I think we were a bit spoiled coming right from the calm beauty of Croatia. We enjoyed our time in Vienna, even checking out Mozart's The Magic Flute at the beautiful Vienna opera house. 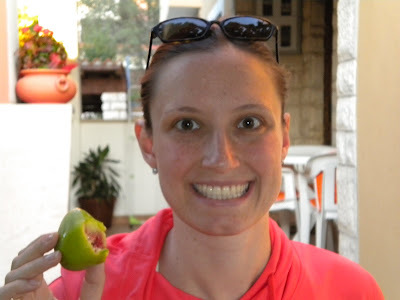 Here are some foodie highlights. 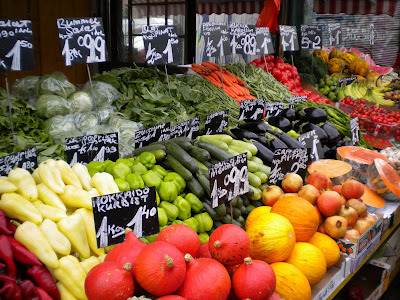 Veggies for sale at the wonderful Naschmarkt. 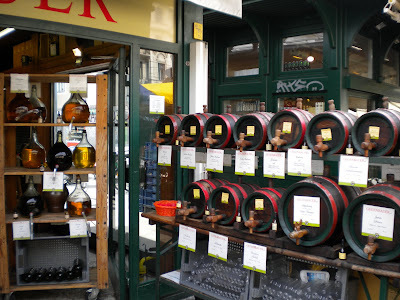 Olive oils and vinegars for sale. 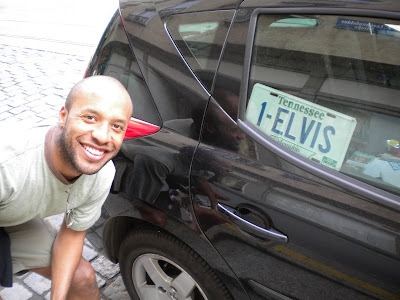 There's always an Elvis fan... just down the street from our apartment in Vienna. 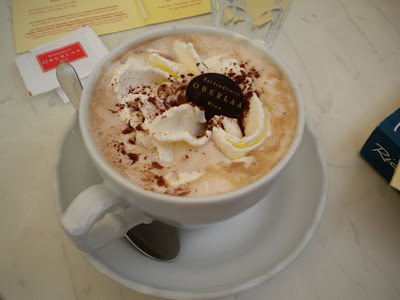 Delicious hot chocolate from Oberlaa. 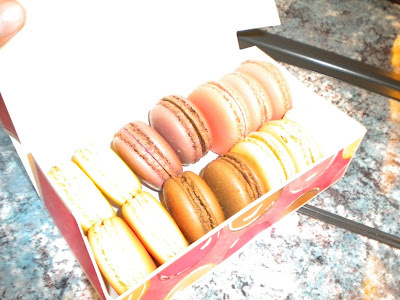 Different flavored macaroon cookies, also from OBERLAA - I loved the lemon and the raspberry. 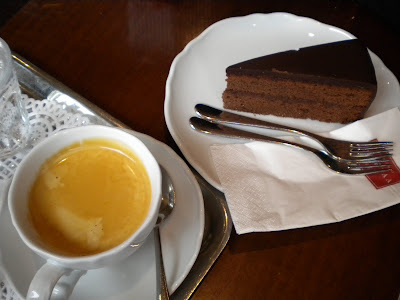 Sachertorte from Oberlaa - with coffee. 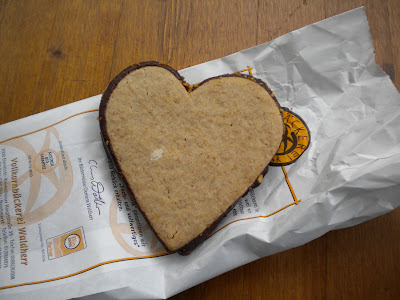 Cookie from the market - delicious. 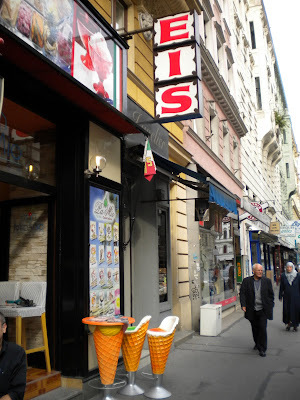 EIS = ice cream and small shops serving it can be found all over Vienna. 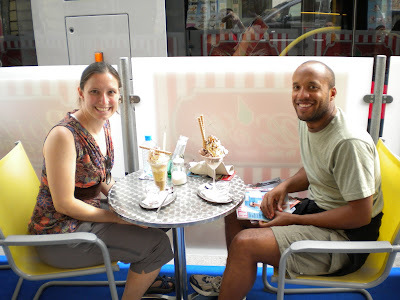 Trying Eis Kaffe - ice cream with cold coffee poured over the top. Calvin's had Bailey's too! 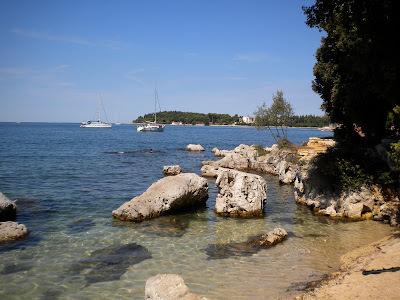 The Istrian peninsula of Croatia was by far our favorite stop on the trip. 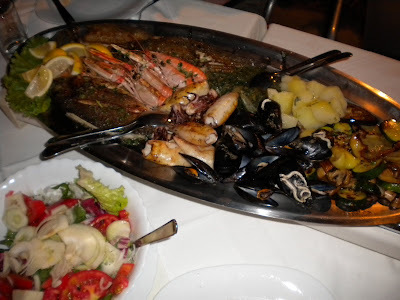 Lots of great seafood, lovely inexpensive rooms (there's also an apartment) at Rooms/Apartment Lara, and a laid-back, relaxed atmosphere. The weather was perfect - warm, 80 degree days and cool nights. I would go back in a heartbeat. 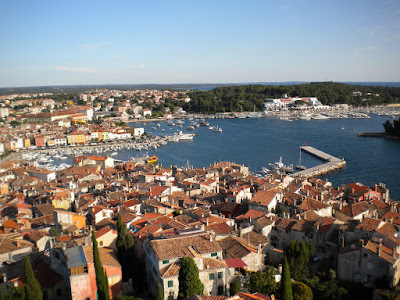 View from Rovinj bell tower. 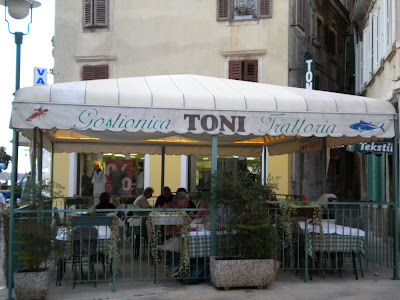 Another great meal at Gostionica Trattoria Toni. 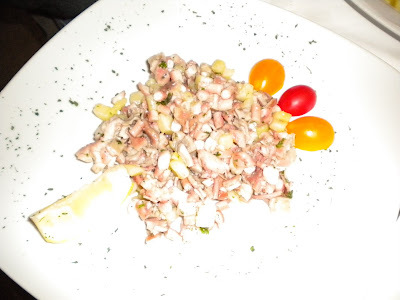 Rovinj octopus salad - very tender and tasty. 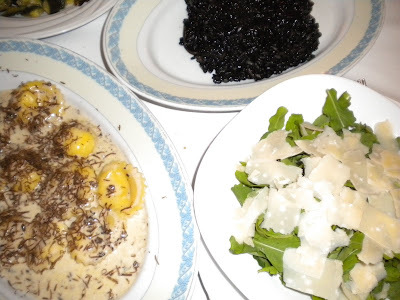 BEST EVER ravioli with shaved truffles, arugula with fresh cheese and squid ink risotto with rockfish. 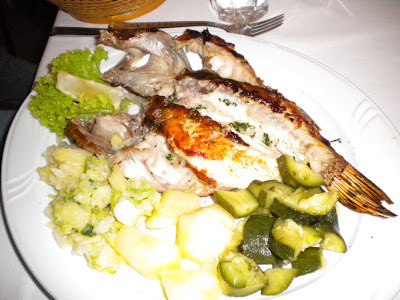 Some tasty fish and veggies - this fish wasn't as good as the first night though. 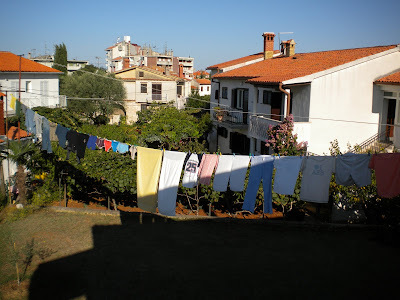 Our laundry drying in the wind. The woman we stayed with (Ivanka) graciously did our laundry. 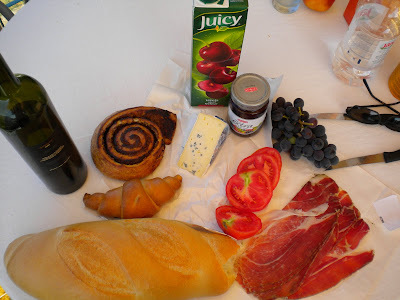 Breakfast from the grocery/bakery 10 min. walk from our rooms - the wine was from the night before! 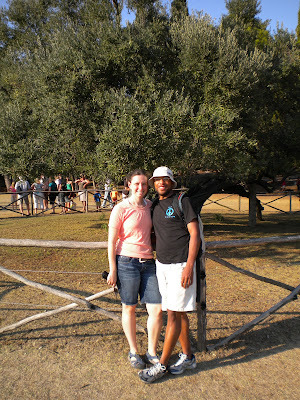 In front of 1700 year old olive tree on Brijuni, the island where Tito used to live. 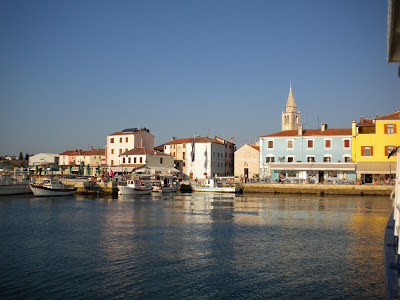 View of Fazana from our ferry to the Brijuni Islands. 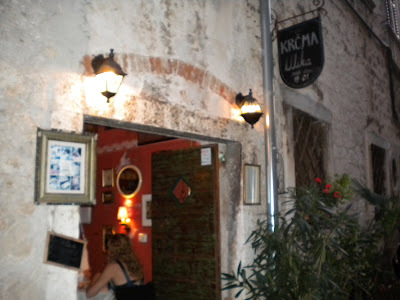 Our last night in Croatia, we booked one of the seven tables at Krcma Ulika, a truly unique, art-filled tiny restaurant on the cobblestoned streets of Rovinj. The meal was quite expensive with wine and three courses for each of us, but it was a high-quality intimate experience we will never forget. 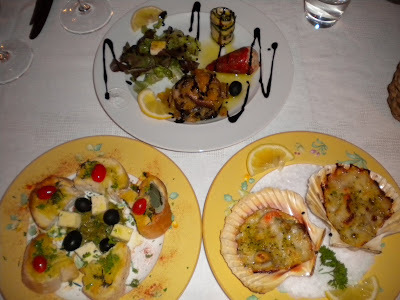 Bruschetta (bottom left), Mediterranean delights (top) and scallops baked in a shell started us off in the right direction. 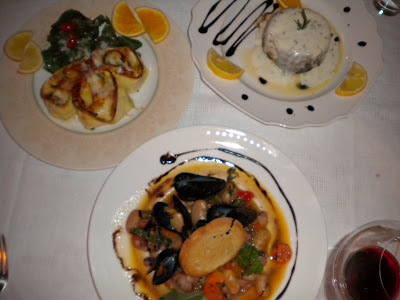 Entrees of sea bass lasagna (top left), sea bass and bean and mussel stew. 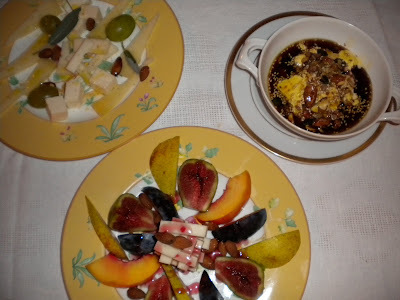 Cheese & fruit plates and ice cream with pumpkin oil delighted us for dessert. 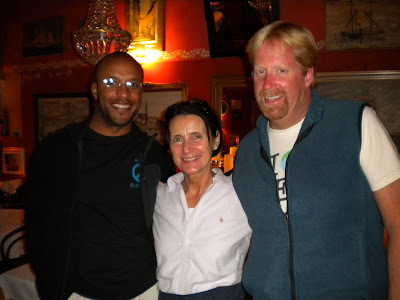 Calvin and John with the woman who runs the restaurant. 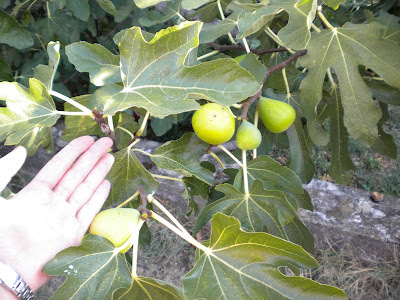 Huge figs grew in Ivanka's yard. Fresh figs are the best! If you want to be on the forefront of great pizza in Atlanta, go to Antico ASAP. Don't mind that there is basically no place to sit down. You'll be happily eating your pizza standing up. Check out the fresh cheese, chopped garlic, chili oil and spices you can add to your already delicious steaming pizza yourself after it's presented to you and cut. The cannoli isn't bad either. Seriously, THIS is IT right now. Go. Go Now! They close when the dough runs out so you should call first. I don't have photos from my Friday evening pizza lovefest, but just trust me, you don't need photos - you need to go try it out! !